The Supernovas are fast, clean and contemporary, a smart new departure for UFIP. Bright, modern vibe. Fast and sensitive in play. One dimensional, lacking slightly in tone and penetration. UFIP began in the 1930s as a collective of small companies in Tuscany, Italy. The UK company Cymbalise was launched in September 2013 specifically to ensure that UFIP cymbals are readily available in the UK. Today we have the, the B8 Supernovas on test. The Supernovas are unusual for UFIP, being made in the so-called sheet B8 bronze European style. 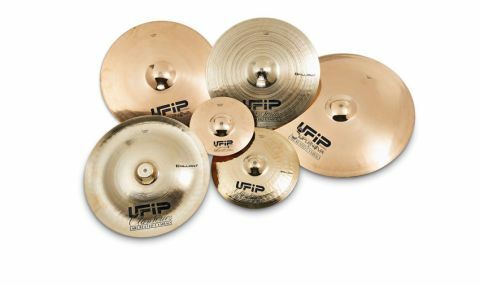 They are about 25 percent cheaper than UFIP's Class Brilliants so are not budget cymbals but more akin to, say, Paiste's professional B8 2002s. They benefit from an "innovative hand hammering procedure using fast rotation". They also have a super-smooth hand-buffed finish. "The cymbals have a fresh, contemporary sound, but are fairly lightweight which adds welcome depth"
The cymbals have a fresh, contemporary sound, but are fairly lightweight which adds welcome depth. The 22" ride has an excellently precise if slightly thin stick-tip response over the main body which has a low pitch with no great variation over the large surface. There's a hint of electro-metallic twang, somewhat like an amplifier hum, but otherwise there are few overtones. Not a particularly complex ride, but the overall vibe is harmonious allowing it to shine in multiple settings. The 10" splash has a thinnish high-pitched 'tiss', while the 14" hats are not tissy enough. The closed stick sound is soft and underpowered. Part-open it's much louder and fuller and being medium light the tone remains quite dark. The 17" and 19" crashes fall clearly into the Supernova character of fast, neat, electro, with a steady, fairly brief decay, again lacking power and complexity compared with the very best cymbals. They are sensitive enough to crash easily with the stick tip though, which shows their quality. The 18" crash felt slightly different with a few stray overtones on decay, making it less clean but more complex. Lastly the 18" china benefitted from the series' warm, soft, dark aspect, making it agreeably less harsh than many other chinas.